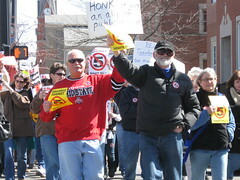 The Ohio Senate Bill 5 that Kasich signed back on March 31, 2011 has received much attention across the State. We will have an article coming soon from a contributor of The Voice ofMiami Valley. In the meantime we will continue to provide articles, state press releases, and other information we can attach to this post. It is quite disturbing some of the information that is being presented throughout the media concerning this Bill. We want to begin a collection of comments attached to this article in your opinion. This will be a great spot for discussing, venting, and elaborating on the policy. The potential damage or support it may bring to Ohio. You can view the entire bill under Law, Acts, and Legislation below. Public workers basically will see many limitations and eliminations to their insurance and pay. The minute the Bill was signed Unions and Democrats started a campaign to repeal SB 5. They hope to have it on the November 8th ballot. Let us hear your thoughts by commenting below!! i have been a self employed for 29 years and I have had to pay retirement, insurance, self employment taxes,own vacations without pay. The taxpayers cannot keep footing the bill for the plush benefits the government workers have. It is time they step up and pay their share too. The big 3 automakers finally figured out they couldn't afford it! Although a little late the day of the big benefits are over people! If I pay taxes to a wealthy elephant, wont you too have to pay that elephant or if the elephant is sick, who will feed it? Surely not the temple. So what do?